One Dozen Cut Out Sugar cookies, so cute and perfect! Use any shape cutter you like! The third most-requested cookie recipe from y’all last week was cut-out sugar cookies. I shared this recipe last year, and I’m so happy to share it again because I happen to think it’s the cutest recipe on this site. I may be biased, but I’m also right. Today is a perfect day to stay home and roll out sugar cookies because we just got our first snow here in north eastern Kansas. There’s no way they would let someone like me on the road today: I have a California driver’s license and Texas license plates on my car. I get disqualified from driving in snow automatically. Not to mention, there’s no way I could keep my eyes on the road because I cannot stop staring at the snow. I love it when the wind blows flurries of snowflakes! Our yard looks like a Christmas card. When the snow plows came through the neighborhood at 2am last night, I hopped out of bed like a kid who heard Santa in the chimney. Only a Southerner would marvel at such things. So, for the safety of everyone, I’ll stay home and bake. If anyone should slide down into our cul-de-sac and not be able to get out, they’ve got cookies awaiting. I’m worried about the 5 deer that live in woods behind our house. What do animals do in the snow? Maybe they’d like some cookies too? The Mr and I are off to Dallas for the first part of Christmas, then head to Georgia for the rest. There’s no doubt I’ll be posting photos on Instagram. Don’t worry, he’s driving us to Dallas. In a medium bowl, beat together with an electric mixer the butter and sugar. Once light and fluffy, add the egg yolk and extracts. Once well incorporated, sprinkle over half the flour mixture and beat gently until combined, then sprinkle over the rest. Beat until no streaks of flour remain, but be careful not to over-mix. Dust a clean counter top with flour, and dump the dough out onto it. Gather it into a ball and press it into a 2? thick round disk. Flour your rolling pin, then roll out the dough out big enough to cut out about 8 shapes. Place the shapes on a baking sheet lined with parchment paper or a silicone mat. Gather the dough scraps and re-roll to cut out 4 more shapes and place them on the cookie sheet. Place the cookie sheet in the freezer for 5 minutes while you preheat the oven to 350. Bake the cookies for 10-12 minutes, until the edges of the cookies just start to turn brown. Let them sit on the sheet a few minutes before moving them a wire rack to cool completely. Once the cookies are completely cool, make the icing by whisking together all ingredients. Start with 3 teaspoon milk, and add more to achieve a slightly runny consistency. Ice your cookies by outlining the shape using a squeeze bottle or small piping bag with a tip, then flood the icing within the borders to fill it in. 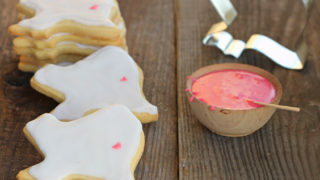 To make the little hearts, scoop a small amount of the frosting into a separate bowl and add red food coloring until you get the desired color. Use a toothpick to make heart shapes. Don’t worry, the deer will likely be fine if it’s not a terribly deep snow. If you do get a couple feet of snow, deep enough that they can’t forage for food, you can get some cracked corn or horse feed at Tractor Supply or Southern States and scatter that out for them. So festive! These sound awesome! I’m snowed in today as well! Being stuck with these adorable (yes, they are adorable) cookies would make things so much more fun! I love that you have a recipe for 12–most cut out cookie recipes make at least 4 dozen, and while I love cookies, I just can’t handle all that frosting. Could these be any cuter? I think not! Merry Christmas sweets! Your bias is spot on – these cookies are adorable! Safe travels and Merry Christmas! Ps, couldn’t love these adorable cookies more. awwww snow! I don’t think I would be allowed to drive in it either. I’m a californian through and through and everyone knows we can’t even drive in the rain! 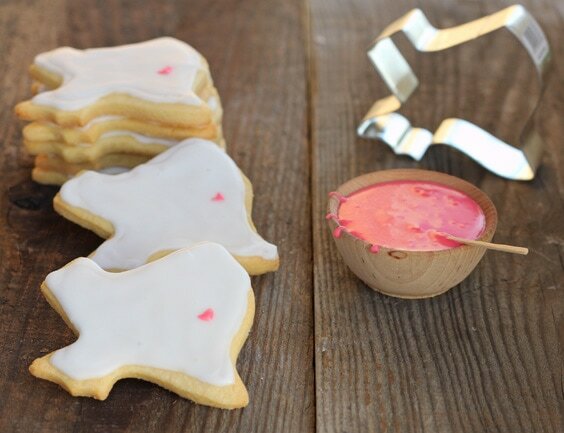 Love that you have Texas cookie cutter and these sugar cookies are so cute! Sugar cookies are definitely a favorite for our family. My plan this year is for Nana to bake the cookies and on Christmas after brunch and gifts…..the grands are going to decorate the cookies. I better get busy!! Thanks, Vicki! Same to you :) Stay warm! Maggie is right about the deer, so don’t worry. Unless it’s deep, they will push it away. Being in North Dakota, I know about snow. Snow is my absolute favorite excuse to bake:-) These are adorable. Hope you and your almost hubby have a wonderful Christmas! I have a Texas cookie cutter tooooooooooooooo!!! Totally making these this weekend – I love it! These are absolutely adorable! I’ll have to get a California cookie cutter :) Happy holidays! Love!! I’m sure there’s a Florida cookie cutter out there!! Have fun with your family! Hope you had a fun holiday in Dallas and Georgia! Your dozen sugar cookies are perfect for not having millions of sugar cookies around to tempt the sweet tooth. Happy holidays, lady! Hope you had a wonderful holiday! Roll out sugar cookies are so much fun, and yours look so cute, too! Just wanted to thank you for this recipe. It is amazing; the best tasting sugar cookies I’ve ever made. My dough was a bit too dry, so I added a bit of milk to hold it together and it was perfect. Thanks again! Hi Christina! – I found your website through a quick google search, and your recipe for a small batch is exactly what I was looking for. The dough was perfect, but I had a question about the frosting.. is 1.5 cups of powdered sugar and only 3-5 tsp of milk correct? I wound up using probably closer to 1/4 cup of milk just to get all of the sugar wet! Thanks for the recipes. Cookies came out perfect. Just what I need today! But how much almond extract? All it states is a “?”. When I switched to a new website theme a few years ago, some parts of recipes were lost. It’s sad. I’m sorry for the confusion! For this recipe, 1/4 teaspoon almond extract is what it needs. Hi, I want to make slice and bake sugar cookies with a little heart inside (sound really hard) and wanted to know if you think this recipe would work for this if I double it. Thanks! Are these sugar cookies soft? Even after storing them in airtight containers for a few days? I can’t wait to make these!